Pool have quickly become one of America’s favorite past time next to Football and Baseball that is. Let’s face it though, who doesn’t love pool? Even beginners can actually fall in love with the interactive game quite easily. You know it to be true, they love it even after missing most of the shots! If you are a beginner and looking out for your chance of vengeance on your next game with the boys, this is a good read for you. I will teach you the basics in playing pool. And hopefully, you could use this guide to improve your game and win them all! Playing pool is not just about aiming and putting out balls. No, no, no. It starts with your equipment. Meaning, your cue. A cue stick is a pool player’s best tool. And what works for one doesn’t necessarily work for all. Cue sticks vary in weight, make and texture. All such factors will have an impact on how you play. So find the best one for you by shooting a few rounds with different cues and you’ll see with which one you get in the best groove with. This is true not just in pool but in every game there is. Nobody has ever won anything without knowing the rules and the objective of the game. Rules may vary depending on what game of pool you are playing. If it’s 8 Ball, then the objective is to sink all pool balls into pockets (stripes or solids). First to sink all their corresponding balls, and lastly, the eight ball, wins. Terminologies may get your head out of the game if you don’t know them well. So learn about the basic terms to understand the game better. Important and common terms are: break – which refers to the first act of the game when a player hits and breaks the 15 balls using the cue ball to scatter them across the pool table. 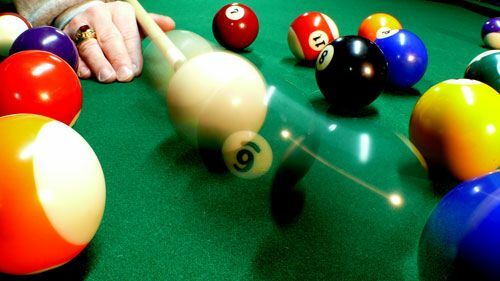 A scratch is when a cue ball jumps off the table or rolls into a pocket. Mastering a shot is important in pool. There are a lot of ways to play, to be honest, but mastering all may take time. If you have just started playing pool, the best advice is to master one way of shooting that you are comfortable with. You will see an incredible change in your play if you master one shot and apply it to your game. This may sound like a generic advice. But with all honesty, the best shots are usually made once you have breathed in. It is not actual science to know that breathing in locks in your senses and gives you more focus. When you make a shot as you are breathing out or after you breathe out, there is a higher chance for you to miss the shot because of the air escaping your system. Try them both and you will see what I mean. Once you are comfortable with one type of game, let’s say 8 ball, move on to experiment on other games. Other cool stuff for you to try is “Cutthroat Pool” and “9 Ball”. These two games are fun and exciting ways to practice for fun or competitively among friends. Playing pool needs real practice and determination. Of course, that could be said for just about any game. So have patience, practice hard and enjoy your time among friends. Sooner or later, you will find that playing pool is more enjoyable because you’ve built up the confidence to play and win!